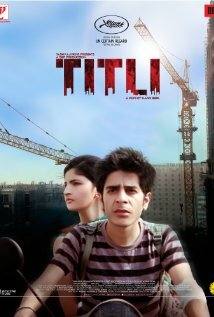 The title character, Titli (Shashank Arora), is the youngest son in a family of thieves. He provides distractions so that his older brothers — Vikram (Ranvir Shorey) and Baawla (Amit Sial) — can beat up drivers and steal their cars. Their TV-obsessed father (Lalit Behl) is disreputable, too. Vikram is the most dangerous of the lot. Those used to watching Shorey play comic roles will find his sinister turn in Titli shocking. Vikram’s own father and brothers are too scared to stand up to him. The only reason his ex-wife was able to escape is that she has enough evidence of Vikram’s spousal abuse to send him to jail for a long time. With the family in dire financial straits — thanks to Titli losing all their money in a poorly planned escape attempt — they decide to add a woman to their bandit gang in order to make heists easier. They do so by marrying Titli to a young woman named Neelu (Shivani Raghuvanshi). As scared as Neelu looks when her parents arrange the match with Titli, she has no idea what horrors await. The film’s most violent scene involves the brothers staging a carjacking while Neelu and Titli are on a test drive. She sees her new in-laws as the monsters they are when Vikram and Bawla beat the car salesman with a hammer and leave him for dead. Not only is Titli at times graphically violent, but director Kanu Behl seems to revel in personal hygiene and bodily functions. Someone in Titli’s family is always brushing his teeth, face covered in foam, drool spilling from his mouth. The noises Vikram makes when clearing his throat are revolting. Titli vomits for what feels like forever. The whole atmosphere of the family’s small corner of India seems grimy, with a translucent, yellow layer of smog permanently obscuring the view. Their apartment is crowded and tiny. One can’t even go outside to escape, because people are always around, selling something or playing a game in the street. There’s so little privacy, it feels like a prison. That lack of privacy leaves Titli nowhere to plan his escape. Then again, Titli is as ordinary a guy as they come, so how good of a plan could he concoct even under the best of circumstances? Shashank Arora is a miracle of casting. As Titli, his default expression is that of someone smelling something foul. There’s a blankness in his eyes. While Titli’s desire to escape his life of crime indicates a moral superiority over his brothers, he’s not a good guy. He was raised in the same environment, so he’s just as capable of violence and deceit as Vikram and Baawla. As Neelu, Raghuvanshi acts as the outsider, as horrified by the conduct of Titli’s family as the audience is. Still, she gives Neelu strength to endure an unbearable situation. A scene in which Neelu and Titli negotiate the terms of their future is the film’s highlight. Behl is a talented director and storyteller. Titli is engrossing, but in a “can’t look away” sense rather than one of hopeful anticipation. I admire the craft that went into making Titli. I just hope I never have to watch it again. This entry was posted in Reviews and tagged 2014, 2015, 3 Stars, Amit Sial, Bollywood, Hindi, Indian, Kanu Behl, Lalit Behl, Movie Review, Raghuvanshi, Ranvir Shorey, Shashank Arora, Shivani, Titli on October 27, 2015 by Kathy. Same here! Thank you for the excellent review. Hi Kathy…Loved your review (as always). By the way, where did you watch this movie? Thanks, Amin! Titli was featured at this year’s Chicago South Asian Film Festival. Only minor problem (not so a problem as families are different) I have that is Bawla’s character. He is gay and family is like they know but don’t talk about it, may be they are a criminal family that’s why its like that. But in reality Bawla would’ve been married off just like Titli. On the note of those teeth brushing scenes, I’ll give you lil trivia as the preparation for role of Titli went too far. Director asked Shashank to take a dump outside one morning like many in Mumbai do while joggers watch him. That exercise made him feel humiliated and director was like that’s how Titli feels his whole life. Interesting insights, Parth. Even though it would not be true to reality, I wonder if director Behl’s point about Bawla’s family not making a big deal of his homosexuality is just that: to show that it’s not a big deal. The other possibility is that his status as a marriage-eligible bachelor was addressed in an earlier draft and cut from the final film. I’m choosing to believe in the more progressive possibility just because of how fun it was to watch a Hindi film where the collective response to a gay character — by both the characters and the audience — is just, “Oh, he’s gay.” Also, kudos to Behl for writing Bawla as a tough guy, rather than the usual effeminate Bollywood stereotype. Casting a handsome actor in the part was a good move, too.